This molded mahogany plywood boat's hull was made in Canada in 1942. It was sent to the states and the sternboard was installed by the Magnavox Corporation. My father acquired it in 1963 for $60. The steering setup is an evolution of the Adirondack lever system passed from my great grandfather on down. 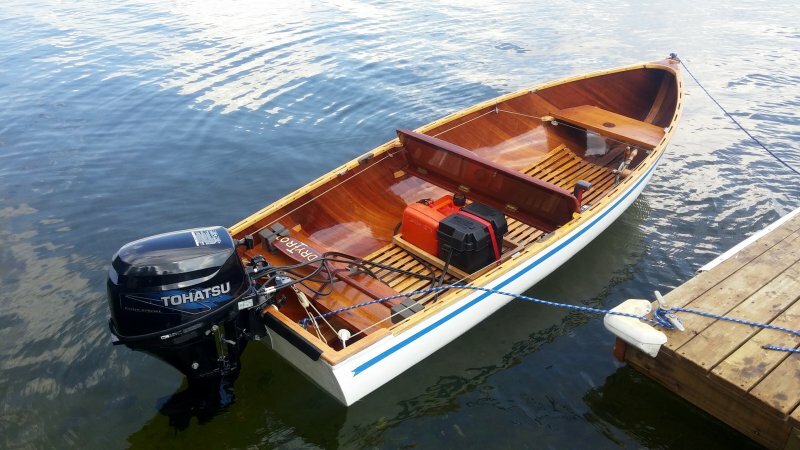 I undertook a complete restoration three years ago including a new mahogany stem and keel, oak backbone and sternboard reinforcement and a complete refinishing using West System epoxy on the interior and Interlux Easypoxy paint on the exterior. The Tohatsu four stroke 9.8 has electric start and a charging system allowing complete control from the center position. The boat sans motor now weighs about 60 lbs allowing a top speed near 30 mph. The magic of feeling every ripple through the seat of your pants as the bottom flexes is awesome!